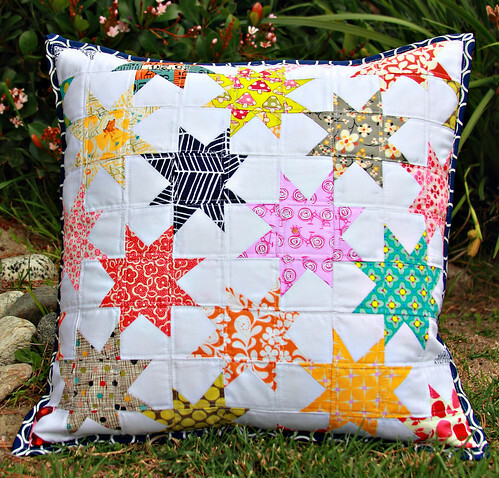 Stitches and Scissors: Mini Quilt Challenge - Oh My Stars! 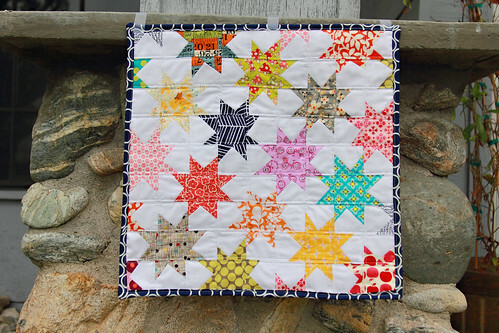 Mini Quilt Challenge - Oh My Stars! I wanted to join Amy's Mini Quilt Challenge since mini quilts can just be anything they can turn into a quilt, pouch, mug rug, or my favorite a pillow. So yesterday I worked long and hard on my mini. 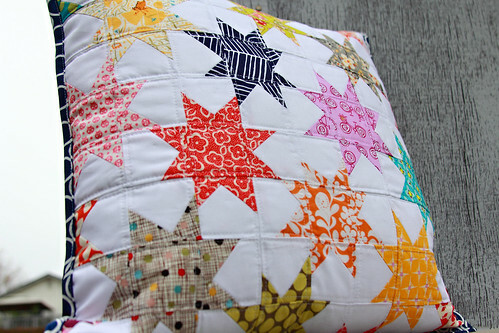 I have been wanting to make the interlocking stars quilt for a long time now since I saw Faith's awesome one and then Amber made a pillow version that was scrappy and I was hooked! I of course turned my mini into a pillow since pillows are my favorite things. I already have my fabric for my quilt version of this pattern. I am finally going to cut into my beloved Park Slope prints and make a twin size version ASAP. I am that in love with this pattern. If you want to see some more awesome mini's and what everyone has done with them go over to Amy's post and check out all the mini's that have been linked. 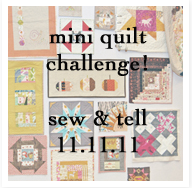 Also you can still join and link up your mini quilt! This is a great pillow Darci and this pattern will make a beautiful quilt. Super cute, Darci, and I can totally see it in a big quilt in Park Slope. It's going to be gorgeous! I love it, too!! And I'm totally impressed by how fast you made it. Can't wait to see your PS one! I love this pillow. Looks gorgeous! your stars are fabulous! lovely pillow! 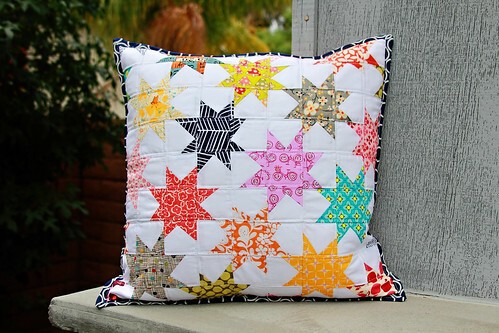 A fantastic pillow - love those funky stars! Oh I just love all those colourful stars! There was a great scrappy quilt in this pattern in the Bloggers Quilt Festival too. I was thinking of doing 6 inch squares and using my Urban Chicks Dream On. How big are you making your squares for a twin size? I've definitely had this on my list since I saw Faith's too. Yours is so pretty! Love it, Darci! I've been having lots of fun with wonky stars myself lately. It's great! That is just beautiful and makes a great pillow! Love it! Beautiful! I love any stars right now and this pattern is gorgeous! The binding is such a nice addition. A great idea for a cozy pillow. I love all those wonky stars! This is a beautiful pillow and I know the quilt will be amazing. I'm looking forward to seeing it completed.